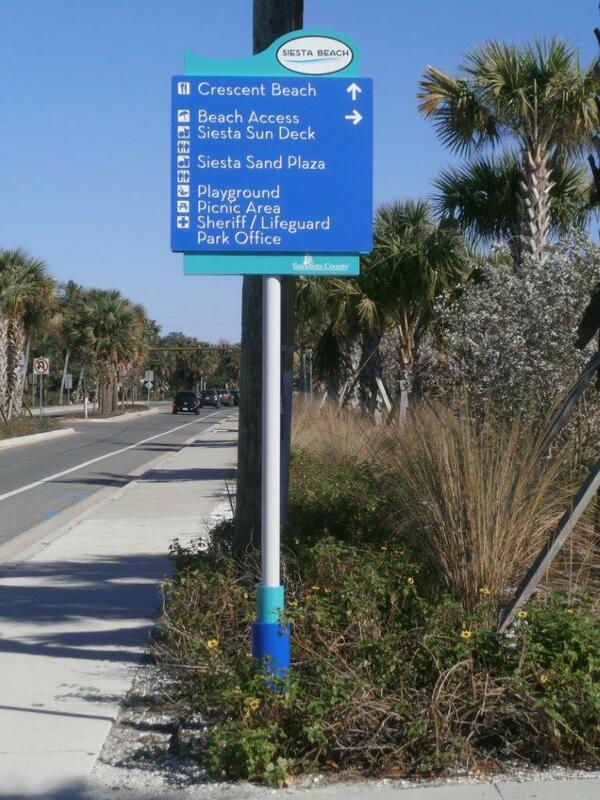 Sarasota County to celebrate the completion of the Siesta Beach improvements project with a ribbon cutting ceremony this Saturday, 2/20/16 at 9 am. Jon F. Swift Construction was selected as Construction Manager for the 24 month project that included an upgraded and elevated concession area, modern and expanded restrooms, the relocation of several buildings and restoration of the historic pavilion as a public gathering place, improved access to and from Beach Road, an expanded and renovated parking lot and a pedestrian esplanade connecting the park from east to west. To help the public navigate the newly transformed destination Gulf Coast Signs was brought on board to create a series of way-finding signs and banner structure poles that serve as identifying markers for the renovated parking lots along the esplanade. The final elements provided were computer cut dimensional letters mounted to the face of the north, south and central monument signs at the borders and entries to the beach park. We’re proud to have been a part of this project and look forward to enjoying the new amenities with our neighbors and visitors for years to come.